I am a northwest global-hearted artist exploring subtle relationships through fine art papier mâché sculpture ranging in size from six inches to six feet, often enhanced with my own poetic story writing. 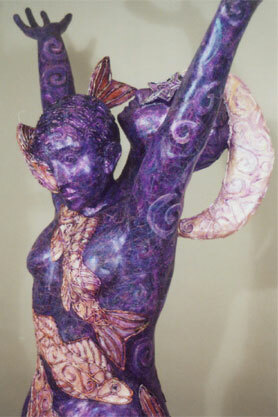 My sculptures are one-of-a-kind, labor-intensive creations which sell for $75 to $5,000. All artwork is signed and numbered. Some things to chew on: papier mâché is French for chewed paper. Wasps may be nature’s oldest papier mâché artists and architects. By chewing the bark from trees they create delicate, yet sturdy paper nests. Papier mâché is one of the oldest art forms, believed to have originated in China where paper was invented at the beginning of the 2nd century a.d. It is found in every culture, and while its appreciation as collectible fine art has gone in and out of popularity, there are many preserved, antiquated treasures in existence today which demonstrate the versatility and longevity of this primitive art medium. Centuries old papier mâché can be seen in books, museums and private collections. Prices for such antiques can range from $90 to $65,000+.